When it comes to the critics, it seems that some places can just do no wrong and Diamond d’Angkor is one of them. Average rating 9.2 from 1,246 reviews. 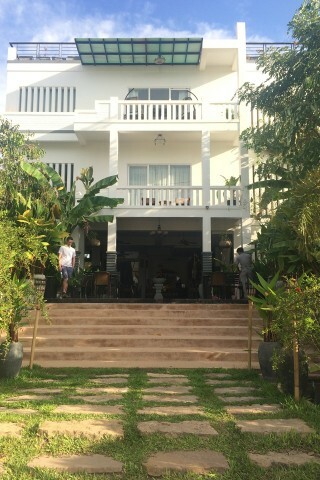 Only five minutes from the centre of Siem Reap, on busy Sok San Road, the hotel is a quiet, stylish retreat where customer service is king. The art deco-influenced building houses just 15 beautifully-conceptualised and spacious rooms and suites that blend the best of the modern world with careful traditional touches. Nothing has been left out. Taking a unique approach to pricing, the full-price rooms come with all kinds of additional services, such as free use of a tuk tuk, complimentary mini bar, laundry, breakfast plus one meal per person per day, free use of a mobile phone for local calls, pick-up and transfer and more. Or you can scale down your expenses and book the rooms to include breakfast and pick-up only. If you book into a suite, you get even more with a free private car, driver and guide, free use of an iPad Mini, and more. This makes these rooms enormously good value, and offering the choice to guests like this is an inspirational move. Downstairs, the small restaurant area is flanked by a chatty-looking bar, and looks out on the pool. If lounging poolside seems a little too energetic, then check out the spa which is open from 10:00 to 22:00, and offers a range of services including facials, massages and scrubs at reasonable prices — for example a 60-minute Swedish massage is just $17. This place has been picking up awards all over the place in its very short lifespan. They say that the prices below are variable, depending upon occupancy. Check rates at Diamond d’Angkor on Booking.com.